BLOOD SONG (UK | ANZ) was published last week to a chorus of rave reviews and online buzz that heralded the novel as one of the year’s best epic fantasy debuts and author Anthony Ryan as a huge new talent in the genre. In this exclusive interview, Anthony talks to us about his work and inspirations. Blood Song is an epic fantasy in every sense of the word – particularly in that it took you six years to write! Why did it take so long and what was the spark that started it all? Working a full time job whilst studying part time for a history degree had a lot to do with the time taken to write Blood Song. Also, although I had a one page synopsis, I wasn’t working to a detailed plan, something I’ve subsequently learned is very useful in speeding up the writing process. It’s always difficult to pin down the genesis of an idea but I recall the basis of Blood Song germinating for a few years but not really coming together until I started my history studies. The themes of religious conflict and political intrigue were also at the forefront of my thinking in the aftermath of 9/11 which probably had an influence. You were influenced initially by Lloyd Alexander’s Prydain Chronicles, and then later by legendary British fantasy author David Gemmell. What was so special to you about the works of these two writers, and how do you think they influenced your own writing? Although I was aware of Tolkien as a kid my first foray into fantasy began with Lloyd Alexander, who was writing YA fantasy long before it had a name. The Prydain Chronicles are essentially a coming of age tale mixing Welsh legend and epic fantasy, completely capturing my ten year old imagination from the moment I picked up The Book of Three. There are echoes of my main character Vaelin in Alexander’s Taran, orphan and apprentice pig keeper continually beset with questions over his past and doubts about his future. Whilst Lloyd Alexander began my love of fantasy, David Gemmell ensured it continued into adulthood with the wonderful Wolf in Shadow, an action packed but also sublimely sombre tale mixing the western with fantasy. Gemmell is primarily remembered for the pace and action of his books but I also think his characterisation is excellent; his characters are flawed, conflicted and, most importantly, consistent whilst also being capable of change, all elements I’ve tried to include in my own work. What is it about epic fantasy as a genre that attracted you to it, from a writing perspective? Given that you studied medieval history, did you ever consider writing a purely historical novel? I’ve read plenty of historical novels but not yet had the yen to write one – though I do have a germ of an idea for a historical detective story, so who knows? However, at the moment I think I would find it too restricting; you have to spend a long time on research and are stuck with recorded events that can’t be changed. Epic fantasy gives the writer the room to create the history of their imaginary world allowing a great amount of scope for drama, spectacle and a combination of themes that would be denied the historical novelist. You originally self-published Blood Song and achieved considerable success, so why did you decide to sign with a traditional publisher? Simply put, I weighed up the pros and cons and decided it was the best decision for me. Although I think self-publishing is a great thing, and continue to self-publish my Slab City Blues sci-fi novellas, I wanted the Raven’s Shadow trilogy to have the widest possible audience, including foreign sales and access to bookshops. A traditional publishing deal still seems the best way of achieving that. 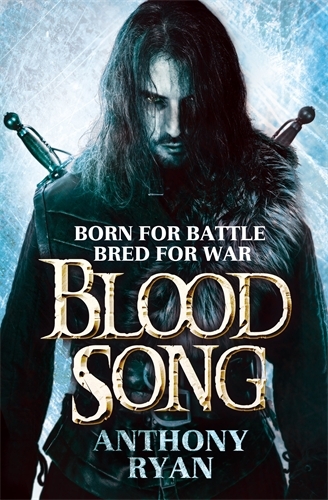 Blood Song eschews the multi-viewpoint format used by so many current epic fantasies, focusing instead on telling the story from Vaelin’s point of view. What are the advantages and limitations of this more singular approach? The primary advantage is that it enables a more thorough exploration of character over the course of a fairly lengthy narrative; we see Vaelin’s journey into adulthood with all the many tribulations on the way, which hopefully adds a greater emotional resonance to the ending. Also, for a fantasy author, a single point of view begun in childhood enables a more narrative-driven approach to world-building; we learn about the politics and history of Vaelin’s world as he does, avoiding the dreaded info dump in the process. The disadvantage is that a lot has to happen off-camera, which is why the sequel has four point of view characters instead of one, as the scope of the overall story has expanded greatly. If I ever got lucky enough to write the whole trilogy I had always intended to open out the narrative, a device I found particularly effective in David Eddings’ Belgariad which features just one POV until halfway through the third book. You’ve already finished the second novel in the Raven’s Shadow trilogy, and are well into writing the third. Have you always had an overall plan in mind for how the trilogy would pan out, or have you generally been making it up as you went along? As I said earlier, I had only a one page outline for the first book. The outlines for Books 2 and 3 are much more extensive, running to over 4000 words each. That being said, I do frequently deviate from them as I find actually writing the book the best way to develop plot and character. However, unlike the writers of Lost, I always had the general shape of the story in my head and know how it all ends. One of my favourite characters from the book is Master Sollis: grim and steely on the outside, but perhaps a little softer on the inside – if you can get past his stern façade. Was there any particular inspiration behind this character – an old schoolteacher perhaps? I had some great teachers as a kid (and some not so great), but I can’t recall any even vaguely resembling Sollis. He’s kind of the ultimate PE teacher meets the ultimate Sergeant Major. He came about because I needed Vaelin to have an unyielding mentor, someone even more single minded and devoted to the Order than he is, but also never needlessly cruel (at least in his own head). You’ve made the jump to becoming a full-time writer – how has this changed your writing routine and lifestyle? Do you find you’re a lot more productive, now that you don’t have to fit the writing in around your work? The main difference is that I’m a lot less tired these days. My decision to go full-time was motivated by the experience of writing Book 2; producing 2000 words a day whilst commuting to a full-time job was not something I wanted to repeat. Oddly, my word-count hasn’t gone up all that much despite my heroic efforts to resist the lures of day-time telly (actually, that’s pretty easy because it’s uniformly awful). You’re a big film fan, so which actor would you like to see playing Vaelin in any film adaptation of Blood Song? To be honest I’ve yet to see an actor that matches my vision of Vaelin. Also, he’s never fully described in the book because I wanted the reader to conjure their own image of him, something I’m loath to spoil (at least until those nice Hollywood people cough up some option money). Writers are usually pretty bad at casting anyway; I read somewhere that Ian Fleming thought Cary Grant would make the perfect Bond, a good indication why casting directors are paid so much. 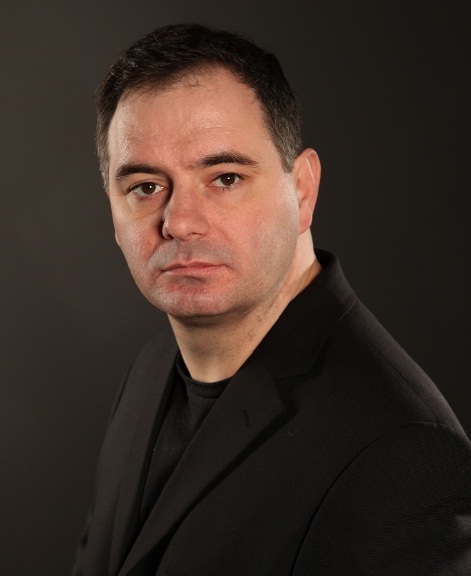 Anthony can be found online at his website and on Twitter. You can read the first chapter of BLOOD SONG here.